Set the Text tag on each BlockEntity in the selection box to be the contents of the text file you specify. Use for updating Minecraft Education Edition Chalkboard text. The attached filter file goes in your filters directory. 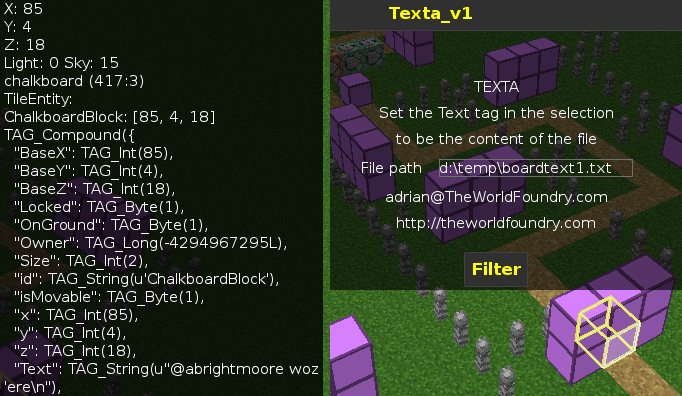 v1 replaces the contents of the "Text" tag. v2 allows you to specify a different NBT tag. Make sure it is a TAG_String type otherwise you will break the BlockEntity.